In a parent level amendment (PLA) structural changes, converting structures to multi-component compounds, adding CSTs or additional data can be performed, but changes involving isotopes, charges or salts/solvates (since these are not stored on a parent level) are not stored. In the case when the amendment was initiated from a parent structure, if there are no parent matches to the modified structure, the PCN will be kept for the modified structure. If the exact match is accepted, a Summary window appears reporting the eventual creation of new version(s) and the movement of all the versions and the lots from the original tree to the accepted tree. If the accepted PCN doesn't contain the version from the original tree, new versions will be created and all the lots from the original tree will be moved under the appropriate versions. The original tree will be kept with empty versions (containing no lots). 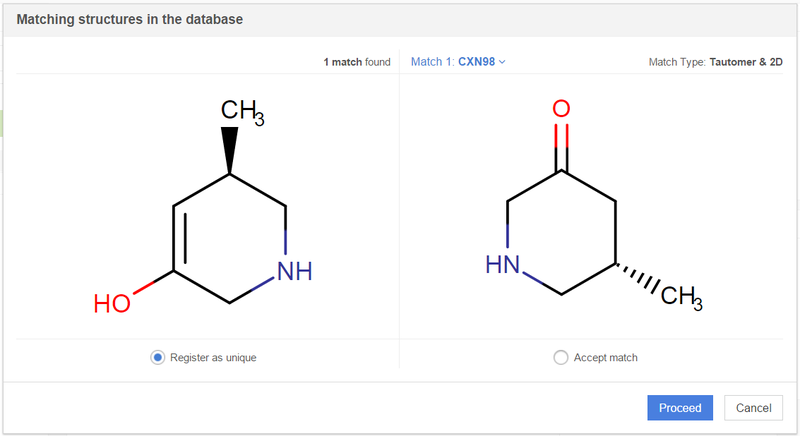 In case of 2D, tautomer or tautomer&2D matches (if exact match is not available), only two options are available: unique and accept (replace action can only be used when the amendment is initiated from version or lot level). E.g when amending a compound on parent level to (5S)-5-methylpiperidin-3-one, having (5R)-5-methyl-1,2,5,6-tetrahydropyridin-3-ol (CXN29) as a tautomer&2D match, unique and accept options are available (Figure D1). Single compounds used as components in multi-component compounds can be amended only on parent level. If trying to amend such compounds on lot or version level "Editing the structure is not permitted. This selection is used elsewhere (CXN...). To avoid inconsistencies, please edit this structure on the parent level." warning appears. On parent level, another warning is received: "Amendment might affect other registered compounds. The PCN "CXN..." is used as part of multi-component structures (CXN...)". To "Keep PCN of this single" in which case the amended single's PCN will be kept and the original tree will be updated, while the multi-component compound will be linked with the component's new PCN. The other option is to "Keep related AMFs PCN", in which case the amended single will receive a new PCN, and the new tree will be updated, while the multi-component compound will be still linked with the component's original PCN. In both cases, the single's parent level amendment is reported in a Summary window. Editing multi-component compounds on parent level is not allowed.